Angie, Ollie, Simona, Mario and Eric are friends. Each one is amazing in their own way. Angie has incredible vision. Ollie has incredible hearing. Simona and Mario are unbelievably strong. And Eric has his own particular talent. What's not said in the text, but is evident from the illustrations, is that each of the friends has their own disability too. They just don't let it stop them. So when they all go on an adventure to the countryside and disaster strikes, it's not what they can't do that matters. It's what they can do that saves the day. 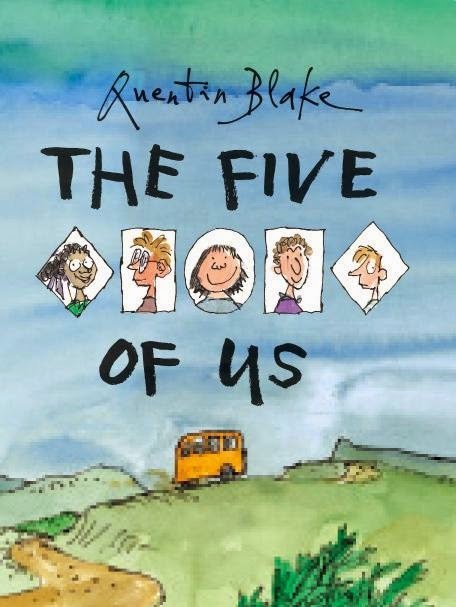 Quentin Blake is one of the UK's best-loved illustrators and picture book creators, and The Five of Us is a perfect example of why he's held in such high esteem. Subtly, yet oh so powerfully, his story reminds us that the world is always a better place if we use our strengths, work together, and don't focus on the negatives. Visit Quentin Blake's website to find out more about this extraordinary artist and his work.